The Big Picture was introduced by Big Picture Education Australia in 2006 to create personalised education programmes that are unique for each student. It is a rigorous and highly personalised approach to education that combines academic work with real-world learning. With a philosophy grounded in educating one student at a time, Big Picture supports students to create a personalised learning plan based on their own passions and interests. The programme empowers students to develop the knowledge, skills and character they will need to build successful careers and fulfilling lives in the 21st century. Learning is personalised to the individual student – one student at a time. Learning has academic rigour and credibility. The Advisory structure builds relationships and trust. A student’s family and the wider community is involved in their education. Develops the knowledge, skills and character needed to build successful careers. Big Picture promotes life-long learning. The design allows for the development of 21st Century skills. Students can study their chosen topic in real depth. The joy of learning is promoted. Big Picture is about real learning and not just about passing exams. Need to know more about our Big Picture Program? 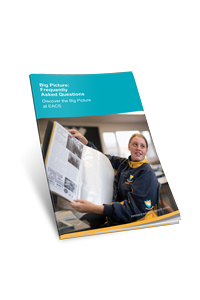 Download our Big Picture FAQ Flyer to discover all there is to know about this innovative program.